The Domus Tiberiana was the first of the imperial palaces to be designed in such an organic way and the first to appear on the Palatine Hill. 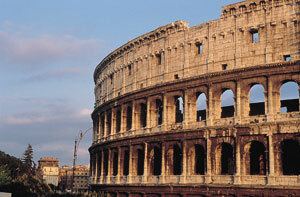 Rome tours following the steps of the Roman Emperors have always included this interesting, ancient building. It was erected behind the Temple of Magna Mater, on the western slope of the hill that overlooks the Roman Forum. The structure was only very partially excavated, as since the sixteenth century, the area where it remained, was occupied by the Farnese Gardens. Still visible in the southern side of the complex is a series of rooms with a rectangular plan, made of brick and covered with a barrel vault, perhaps ordered by Nero. In this area in the vaults were preserved traces of painted decoration with figurative scenes inserted into sections that can be dated to the third century after Christ. On this side of the building, in the south, we find a tub of oval shape with steps, where we recognize possibly a fish farm. The eastern side consists of a long cryptoporticus where we still admire paintings and floor mosaics. At its northern end, it branches off to a division to the west side, later built to connect the whole building to the House of Augustus. The northern side of the House of Tiberius overlooks the Roman Forum and it is the most preserved. It consists of two groups of rooms with different orientation, which are arranged along an ancient road, the Clivus Victoriae. The area further east, which has rooms oriented as the rest of the building, is due to a reconstruction of Domitian after the devastation of the palace since the aftermath of the fire of AD 64 and 80. Next to this section there are other spaces, beyond the Clivus Victoriae, attributed to Hadrian. In the second half of the nineteenth century, the central part of the building was excavated and then covered again: it was found a peristyle of vast dimensions, where some rooms open onto and are connected by two corridors to the east side of the cryptoporticus.